Following the article on 5 Things You Should Know about Trade Unions in Singapore, we got curious and started to read up a little on the strikes that had happened in our tiny little island. And TA-DA! We present a piece on the Hyril Strike that took place back in 1986. So now, who says there ain’t no strikes in Singapore? What Was The Hydril Strike? On December 30th, 1985, a branch union of the Shipbuilding and Marine Engineering Employees’ Union (SMEEU) held a secret ballot. The issue was the dismissal of six union leaders by the American company Hydril. There were fears that Hydril was about to go on a sacking spree because of an economic recession, and that the removal of union leaders was a pre-emptive “Union busting” attempt. It didn’t help that some 90% of Hydril’s workers had been subject to disciplinary action – warning letters, verbal warnings, etc. – over the past six to nine months. The union balloted in favour of industrial action. Hydril was tipped off about the ballot by an anonymous union member. However, they were not informed of the result. But because strikes in Singapore required – and still require – the approval of the government, the Ministry of Labour got wind of it early. A phone call was made to Hydril, from the office of the Director of Labour Relations (at the time, Mr. Ong Yen Her). Hydril’s management was asked to contact them, to discuss the possibility of a strike. Mr. Ong’s office would never get the return call. It was missed due to the difficult timing – it was the eve of the New Year, and when Hydril’s Human Resource department called back, Mr. Ong had been occupied with the festivities. So right after New Year, on January 1st1986, Singapore had its first strike in almost nine years. We had fantastic communication between government and corporate arms then, and we have it now. By staying in touch, Singapore avoids wildcat strikes: sudden service shutdowns that cause massive disorder. Ever wondered what happens if something as simple as a shopping mall goes on strike? Orders are undelivered, inventory goes missing, the stuff you’ve paid for never appears, etc. By keeping a step ahead, the government is braced to handle any difficulties from a strike, and to start negotiations early. The day started with workers clocking in as usual, except they didn’t start work – instead they picketed the grounds outside the Gul Circle factory. Union leaders co-ordinated the strike front, totaling some 60 odd strikers (not all from Hydril, other union branches joined in), and ensured a peaceful demonstration. Strikers took turns chanting and waving placards, but the overall atmosphere was calm. Even then, communication between Hydril and its workers were good. Strikers still had conversations managers they recognised, and the more dramatic events associated with strikes – vandalism, fights, riot squads etc. – never surfaced. The Hydril strike felt more like a picnic than a picket. But don’t take that for granted – in many other countries, governments would consider a strike well resolved if no more than one nose gets broken. As much as we sneer at Singaporeans who “just follow law”, that mentality’s a huge upside when disputes come to a head. For reference, a recent mine strike in South Africa (2012) claimed 44 lives and over 70 injuries. Hydril’s managers used a typical two step process to bring the strikers back. First, they went to meet the workers and applied simple persuasion. 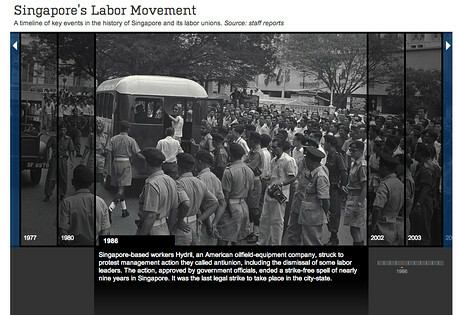 When that failed, they imposed a lock-out period: strikers were given a specific time limit in which to return to work. Failing that, the company reserved the right to hire a replacement. Meanwhile, President Ong Teng Cheong was justifying his decision to sanction the strike. Some government bodies, such as the Economic Development Board (EDB) were adversely affected. EDB was put on the spot while running their “Invest in Singapore” campaign in America, and had to field unexpected questions after global news networks ran the story. In the meantime, the Labour Ministry addressed Hydril and the workers in separate rooms, in order to come to an accord. Hydril’s headquarters was adamant in its decision not to reinstate five of the fired workers, but did provide compensation. A change was also made to the way Hydril handled its disciplinary proceedings. Previously, an underperforming worker would be given a verbal, and then written, warning – if they performed well afterward, the written warning would be ignored. However, the written warnings would stay on their record. Over time, this accounted for 90% of the staff having received disciplinary action. When staff members again began to underperform, managers could raise these past infractions as grounds for termination. After talks with the Ministry of Labour and the Union, Hydril agreed that, if a worker performed up to standard for three months after receiving a written warning, the warning would be expunged from their record. The strike was called off on January 4th. For a time, there was a running joke that the strike ended because they’d already wasted New Year’s Eve, and no one was about to sacrifice the weekend as well (January 4th was a Saturday). On the next Monday, everyone went back to work like nothing happened. Even in other developed countries, it’s rare for a strike to end so fast, and with almost no damage to life and property. If you look at strikes in most countries our age (e.g. the Hong Kong 1967 Leftist Riots), you almost invariably see a rifle or stick being used on someone. Here, we settled it words and at most an angry phone call or two. It’s an enduring quality that we continue to maintain – a three way relationship between government, the private sector, and the individual worker – that makes Singapore such a great place for life and business. As NTUC’s Secretary General Lim Swee Say points out, it’s better to have a union that protects its workers without strikes, than a rowdy union that strikes and wins nothing for its members. Previous Post GUIDE: What to try at Ramen Champion?